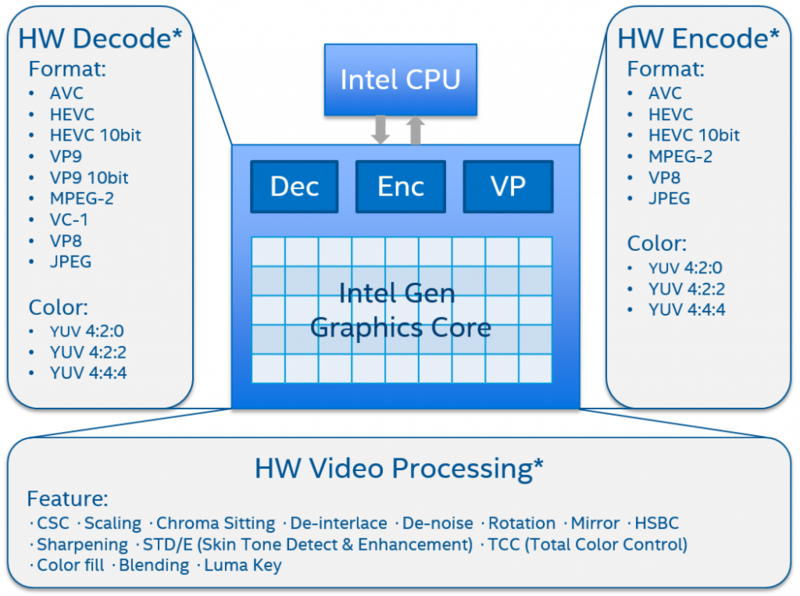 Intel media stack is a comprehensive set of software packages for hardware accelerated video encode, decode, and processing on Linux*. Intel graphics processing units (GPUs) contain one or more hardware-based decoder, encoder, and video processor for several popular codecs and features. * The diagram represents support for an Intel next generation processor, codename Ice Lake. You can use existing applications for decoding, encoding, and processing hardware accelerators on your GPU, by leveraging the integration available in the FFmpeg*, Gstreamer*, Open Broadcaster Software*, Intel® Media SDK, and Chrome OS* media framework. Based on strong hardware support, several customers chose Intel® Graphics Technology for popular uses such as: game streaming, cloud gaming, video analytics, short video, video cloud, In-Vehicle Infotainment system (IVI), video surveillance, and others. The Intel® Media stack provides a total media solution based on Intel® Graphics Technology. It includes the Intel® Media driver, Intel® Media SDK, LibVA, middleware support, and HDCP service. The Intel® Media Stack also supports well-known open source media frameworks like FFmpeg and Gstreamer. The following diagram shows all media stack components. ​LibVA: an implementation for VA-API (Video Acceleration API) - an open-source library which provides access to graphics hardware acceleration capabilities. LibVA-utils: a collection of utilities and examples to exercise VA-API in accordance with the libva project. Media SDK: an API to access hardware-accelerated video decode, encode and filtering on Intel platforms with integrated graphics. See details on Media SDK page. 360 SDK: provides a 360 stitching with 2/6 cameras inputs, in open source plan. Capture SDK: provides a game capture solution for game streaming, in open source plan. ​Video Analysis: based on openVINO and clDNN, in open source plan. ​ffmpeg: integrated support of hardware-accelerated video decoding, encoding and processing on Intel graphics via avcodec. There are 2 possible paths: one for VAAPI, another for QSV which stands for Media SDK. See ffmpeg-vaapi and ffmpeg-qsv for details. gstreamer: supports hardware-accelerated video decoding, encoding and processing on Intel graphics. There are 2 possible paths: one for VAAPI, another for Media SDK. See gstreamer-vaapi and gstreamer-MSDK for details. HDCP: includes HDCP SDK and HDCP Srv to provide HDCP solution for GEN based graphics. Note: The vaapi-driver supports up to Cannon Lake, which will be replaced by the Intel® Media driver. If you want to use the latest qualified version, the quarterly release of Media-driver/Media SDK/Libva/gmm is a good choice because it is verified by full test coverage. If you prefer to use the latest stable version, we recommend the bi-weekly tag, because it has passed key features test coverage. Our branch module and release schedule is shown in the following diagram. Note: All information provided here is subject to change without notice. Contact your Intel representative to obtain the latest Intel product specifications and roadmaps.